The elegant well-proportioned red brick house, now known as Ruskin House but historically as Coombe Hill House, is well known to many Croydon residents due to its prominent position on the junction of Coombe Road and Park Lane. This early example of an imposing Georgian Townhouse, built on the edge of the fast expanding town, provides an important place in the history of Croydon and is a rare insight into previous times as one of Croydon's early architectural gems. The building is early 18th Century in origin, although there had been buildings previously on the site. Sales particulars from 1929 suggest that "an old Insurance Plate, dated 1713, was recently removed from the face of the house", obviously pointing to that year as the House's date of building. This same piece of early estate agents' hype also attributes Coombe Hill House, along with Wrencote on Croydon High Street, to Sir Christopher Wren. This was never verified. The earliest record of Coombe Hill House is a Rate Book of Croydon, from February 1749. The book lists Coombe Hill being occupied by Mr. John Owen. John Owen is thought to have been a member of the Society of Friends. He paid 17/6 poor rate on the House valued at £35. He died in 1758, and his widow, Elizabeth, continued to live at Coombe Hill House until 1782. Further Rate Books show that the House was occupied in 1793 by Samuel Scott, from 1796 to 1799 by William Cotterell and from 1803 to 1806 by Francis Nalder, a brewer. From 1851 until 1880, the House was owned by Baron Robert Amadeus Heath, the Italian Consul General in London, and one of the first Governors of the Whitgift Foundation. It was in this period that extensive changes were made to the House, the first floor extension on the Park Lane side, for example. From 1896 to 1901, Robert Glenn, Recorder of Croydon, lived at the House and from 1902 until his death in 1929, Alderman William Lillico J.P., Mayor of Croydon in 1905. The estate of Alderman Lillico put the House up for auction, and it was then used as a preparatory school until the Labour Party purchased the House in 1966. Over these two centuries, the size of the estate declined. Once there were stables, a large lawn and kitchen garden, even a tree-lined walk. Now there is still a very large, walled garden by modern standards, both at the front and at the rear, which displays original features. The brick wall and the wrought iron headed entrance gate, and the House itself are listed structures. The House still retains many older features. Steps lead up to the imposing central porch entrance with Doric columns from the gravel path. The panelled hall has a fireplace with an open hearth and stone and marble dressed surround. There is a very fine wooden staircase with panelled walls. The light and airy lounge to the left has a tiled fireplace with a statuary marble mantelpiece, and French doors onto the garden. The present-day bar area, with its lofty ceiling, has a less impressive fireplace, again with a marble mantelpiece and tiled inset. On the first and second floors, there are less details of note. Some panelling and fireplaces remain. There are symmetrically placed sash windows that give much light to the front facing rooms. In the semi-basement, the stone-flagged floors show this as the domestic staff area. There is a trades entrance leading out to a walled-in trades path exiting both to Coombe Road and the rear garden. In 1966, Coombe Hill House was put up for sale. Many people called on Croydon Council to buy the historic building as a town museum. The Borough's Finance Committee eventually turned them down. Planning permission was granted for the future buyers to create office space in the building. Coombe Hill House came to auction on Tuesday 3 May 1966, at 2.30 p.m. The auction took place at the St. James Estate Rooms, Hampton & Sons, of Arlington Street, SW1. Councillor James Walker, Chairman of the Ruskin House Management Committee, represented the shareholders at the auction, and had been given permission to bid at least £30,000. This flexibility proved to be very necessary. Jim remembers, "I enquired about the possibility of providing parking space, by making a gap in the listed wall. The solicitors got into a huddle for over ten minutes. They announced to the crowd that no parking would be possible on the site, and several people walked out of the room at that. That narrowed down the rivals. Bidding was going up in 500s. I bided my time. I made my first bid at £30,500. Vivian Bendall, a Croydon Councillor at the time [and later Tory MP], was acting on behalf of clients and bid £31,000. I made a second bid, raising two fingers - £32,000. Bendall turned round to his clients to get permission to continue - but it was too late. The auctioneer brought down the gavel and it was ours." Bendall publicly attacked Jim Walker for his successful bid - rich considering his own interest in the sale! It took a year to prepare the building for use by the movement. The Cedar Hall was built in the back garden, and much was spent on the interior. 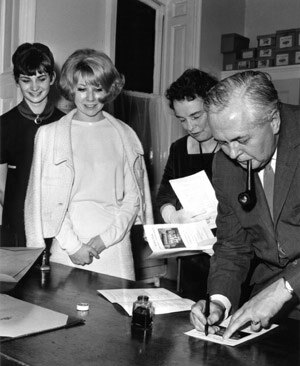 The official opening took place on Friday 12 May 1967, with the Prime Minister, The Rt. Hon. Harold Wilson OBE MP, and Reg Prentice MP, former Croydon Labour Councillor, Minister of Public Building and Works and later a Conservative MP and Peer. The Prime Minister unveiled a plaque in the entrance hall, then toured the premises before meeting members of the movement. 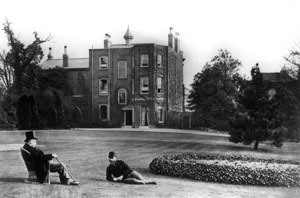 On 25 March 1930, Walter Uphill bought Coombe Hill House for £3,000 from the estate of the late Alderman William Lillico. Uphill was to turn the building into Coombe Hill House Preparatory School for Boys. 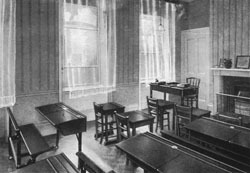 The aim of the School was "to cultivate moral character with a high standard of conduct and manners, and to give a sound, general education in preparation for entrance to the Public Schools." In 1932, fees for a day boy at the school ranged from 91/2 guineas per term for those under 9, to 171/2 guineas per term for those over 13. Uniform was a grey or navy blue suit with the school tie, cap and stockings. Subjects included Latin, French, Nature Study, Singing, Drill and Religious Studies. During the Second World War, the School sustained substantial bomb damage. A V1 had fallen in the road where Edridge, Heathfield and Coombe Roads meet overnight on 20/21 June 1944. Nearby houses and flats were reduced to rubble. Luckily, no one was killed. Damage to Coombe Hill was severe. Glass was turned to powder. The inner and outer walls were blown four inches apart, and there were large cracks in the brickwork. Great care, and great cost - £3,000, was taken to accurately repair the building. The bricks in the front wall had to be replaced - each new brick took at least a day to chip into shape. In fact, 700 bricks had to be moulded. The original door was taken to be repaired and was never seen again, replaced with a replica. Another casualty of the bomb was the school tortoise. It took ten weeks to notice he was missing, according to the headmaster's sister-in-law, having walked out of the garden when the gate had been blown off. Fortunately a lady had found him crossing the road in Park Lane and brought him back as soon as Walter Uphill put up a notice detailing the school's loss. Past pupils of the Preparatory School include Councillor Robert Coatman MBE and David Lashmars of Beanos. Ruskin House's garden is unique, in that the garden represents a view of what a town house garden of previous centuries was like. There were many Villa gardens and mini estates surrounding Croydon; few remain. The size and extent of the garden at Coombe Hill would indicate one of importance. The earliest reliable map that details the garden is the first edition Ordnance Survey Map of 1868. The garden was much larger than we know it today, extending back in length and outwards to the west, beyond what is now Edridge Road. The 1868 Ordnance Survey reveals a large garden and is likely to have been that size or larger for some time. The garden at the rear of the house was one the largest in central Croydon and appropriate for an important residence. The garden frontage of the house was very much as it appears toady with its entrance path, lawn and a flower border following the side wall round. To the left was an elegant looking stable block with a fruit store attached. Further on was another small building and yard, possibly a chicken house, and adjacent was a conservatory. This was unusual, as the conservatory was not attached to the house; its position was on the site of what is now Edridge Road. To the rear of the house, the garden had a circular path running all around the perimeter which was interspersed with straight paths running north to south. The present large Cedar tree is shown and was one of pair, the other being planted out in the lawn. There was a line of conifers along one path which were highly likely also to have been Cedars, as they were highly fashionable trees of the Victorian age. They were all planted along one side of the first dissecting path. This may have been to separate the productive garden and service areas. The large lawn was planted with specimen trees and a shrubbery was immediately on the left and right hand side of the rear of the house directing the view out across the main lawn. A summerhouse stood at the far end of the garden and there was a small ornamental pond immediately on the left-hand side of the rear of the house. In the far left-hand corner of the garden there was a frame yard and along each of the north south paths were small trees which were probably fruit trees and bushes. By 1895 the garden had been dramatically reduced, the area that we believe to have been the productive garden and the site of the conservatory had been lost with the making of Edridge Road. The 1868 plan revealed the conservatory to have stood on an east west axis, but on the 1895 plan the conservatory has been either re-positioned or replaced on a north south aspect. In an 1892 sales description, the garden is described as containing fruit trees and shrubs, flower borders and a summerhouse. The lawn is described as splendid and containing Cedar and Walnut trees. The garden building's include the conservatory and potting shed together with the lean-to fruit store at the rear of the stables. The house is described as being covered in Wisteria and Ivy together with Ampelopsis (Virginia creeper). Early photographs reveal trees at the front of the house; there appears to have been a large purple beech in the front garden on the corner of Park Lane. The garden at Ruskin House, formerly Coombe Hill House, is rather typical of a grand Georgian town house. Whilst its garden could not compare with the Villas and Estates surrounding Croydon, the size and extent of the garden would indicate one of importance. Although the first detailed survey is in the mid-Victorian period, some hundred years after the house was built, it is highly likely that the garden and its contents of paths and fruit had existed for sometime. It is possible to gauge an impression of the early Georgian garden by removing the items typical of the fashion of the mid-19th century. These would include the glass structures and the Cedars trees. 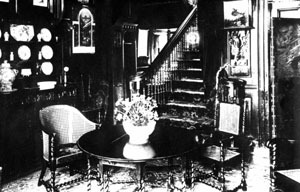 We can establish form the early photographs that the house was not always covered in climbers, not until late in the 19th century. 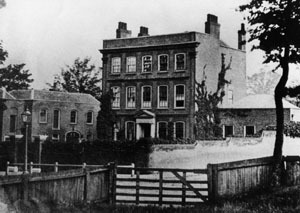 Coombe Hill House c.1858, with the stable block to the left, and the domed extension to the right.